Rugby Town make their last appearance at Butlin Road for nearly a month this Saturday, when they host one of the MFL Premier Division pacesetters Bromsgrove Sporting. The visit of the team currently sat in second place in the table precedes a run of four away fixtures for Valley, with the next scheduled home game not until March 6, when Heanor visit for a Tuesday evening match-up. Town lost out to a single goal at home to Worcester at the weekend, with the visitors good value for the victory against a misfiring Valley on the day. The 1-0 defeat ended a perfect run of three straight victories in January and was only Rugby’s second league reverse in eleven outings – bringing an end to the club’s rise up the divisional rankings. 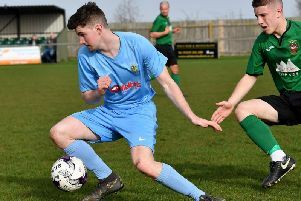 In fact Valley slipped back a place into seventh place after Highgate leapfrogged them, whilst Saturday’s Butlin Road victors City kept alive their outside hopes of promotion to cut the gap between them and third place Sporting Khalsa to two points. The favourites for the reported two places available for advancement to the next non-league step remain the existing top two Coleshill and Saturday’s visitors Bromsgrove – with the Worcestershire club looking to achieve back-to-back successes after their outstanding 2016/17 saw them finally reach the MFL Premier after three consecutive runner-up finishes in the level below. Sporting played out an unbeaten league campaign last time round with 33 victories and 5 draws in 38 matches, as well as reaching the semi-finals of the FA Vase. This season has seen the club - only founded in 2009 - continue their good form – suffering only four league defeats and putting in another decent Vase run, which ended last Saturday with a 2-1 Fifth Round loss at Thatcham. The Bromsgrove squad contains four ex-Town players in Sean Brain, Guy Clark, Richard Gregory and Liam Holt, although only one of them – Gregory – started the recent Thatcham tie. Brain and Clark played just one game during Rugby’s ill-fated 2016/17 season under Gary Moran, whilst Gregory scored 12 goals in 15 starts during the final year of current Town boss Dave Stringer’s previous spell in the Valley hotseat. Holt followed Stringer from the manager’s previous club Chasetown when he returned to take charge in the summer, but made only seven appearances before leaving in September to join Khalsa – and then ultimately moving onto the Victoria Ground. Stringer will be without Josh Ruff for this Saturday’s fixture, after the midfielder was one of four Rugby players booked during the at times ill-tempered Worcester clash. Ruff will also miss next weekend’s trip to Quorn as punishment for totting up ten yellow cards. After the Quorn game, Rugby face three further away fixtures at Highgate, Coventry United and Stourport. In the reverse fixture between this Saturday’s opponents, Bromsgrove ran out emphatic winners thanks to a 4-0 success, with Stringer subsequently acknowledging that game represented the only time this season that his side had been truly outplayed. # Town’s home fixture against Khalsa that recently fell foul to the weather has been rearranged for Tuesday, April 10.